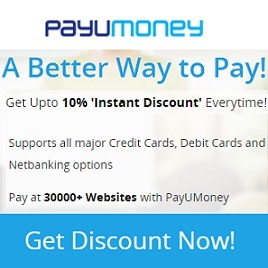 Use PayuMoney Extra Discount Offer to get upto 10% Instant Discount on Payments made through PayU. Shop and pay at partner websites with Payumoney to get extra 2% to 10% discount (maximum Rs.50). You can also use any coupon/voucher to get extra discount. ◾Extra 10% off (maximum Rs.50): Jabong | Zovi | Dominos | MoodsOfCloe | BookMyShow | Babyoye | Infibeam etc. ◾ Extra 5% off (maximum Rs.50): Foodpanda | Shopclues | Goibibo | Fabfurnish | Justeat | Nykaa | Printavenue | Redbus | TastyKhana | BigBasket | Healthkart etc. ◾ Extra 4% off (maximum Rs.50): Groupon | RechargeItNow etc. 3. Choose PayUMoney payment option to make payment. 4. Continue paying through Credit Card, Debit Card or Netbanking Account via PayuMoney. 5. Get instant discount Everytime! Get a minimum of 2% to upto 10% discount (maximum Rs.50) everytime you pay with PayUMoney. This is available on selected merchants and is not applicable for utility / school fee / bill payments etc. PayU India is the flagship company of Naspers group which is a $25 Billion internet and media conglomerate listed on London and Johannesburg stock exchanges respectively. PayU provides state-of-the-art payment gateway solutions to online businesses through its cutting-edge and award winning technology. PayU India serves more than 4000 merchants including leading e-commerce companies like Goibibo, Rechargeitnow, Jabong, Snapdeal, Bookmyshow, Ferns n Petals, Tradus, Travelyaari, Zomato Groupon India etc.